During his turn, Gan Ning can discard any of his black-suited cards and select a card from another character. He places this card on his character card and it is known as a Brocade. Gan Ning can have up to four 'Brocades' on his character card at one time. 1.) The target discards an escape card. Gan Ning can then give this to any player. 2.) The target loses one health. 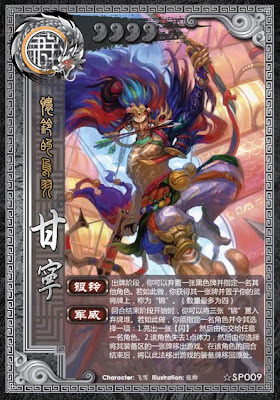 Gan Ning can then choose one of their equipped cards and place it on their character card. This card is then placed back in its original position in their equipment area at the end of their next turn. Unlike the original Gan Ning's "Surprise," SP Gan Ning's "Silver Bells" cannot be stoped with a Negate. "Silver Bells" cannot be used to target delay-tool cards. Gan Ning cannot use "Silver Bells" if he has four Brocades on his character card. The target of "Military Prestige" cannot use the Eight Trigrams armor or conversion abilities (Such as Zhen Ji's "Overturned Country") to convert a non-Escape card into an Escape. Unlike the original Gan Ning's "Surprise," "Silver Bells" cannot be stopped via Negate. Also, SP Gan Ning now has an offensive ability in "Military Prestige." "Military Prestige" can be used to help an ally acquire an Escape and it also bypasses defensive and retaliatory abilities. 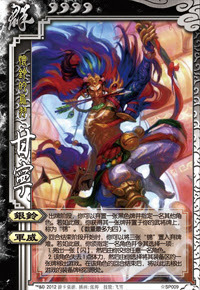 Unlike the original Gan Ning, SP Gan Ning cannot use his ability to destroy delay-tool cards. Gan Ning has very little in terms of defensive abilities. Additionally, "Silver Bells" encourages him to use many black-suited cards. This may put him at a disadvantage outside of his turn if he is not careful. Unlike the original Gan Ning, SP Gan Ning has a restriction on the use of his major ability - if he has four Brocades on his character card, he cannot use "Silver Bells" until he loses three via the use of "Military Prestige." Gan Ning/Zhang Liao - These characters are also card destruction characters. With multiple card destruction characters on the same team, it become very difficult for the opposing team to gain and keep cards. New Ling Tong/Ling Tong/Sun Shang Xiang - These characters have abilities that activate when equipment leaves their equipment are. SP Gan Ning can help them activate these abilities very easily. Lu Xun/ Zhang Chun Hua - These characters have abilities that allow them a minimum number of hand cards at all times. These abilities help them mitigate loses from "Silver Bells." King SP Gan Ning is a mediocre king choice since he has no defensive abilities. Loyalist SP Gan Ning is a serviceable loyalist pick. "Silver Bells" and "Military Prestige" are useful tools for fighting rebels. Rebel SP Gan Ning is best as a rebel. His abilities are very useful in destroying the king's cards and potentially causing negligence damage to him. Spy SP Gan Ning is a mediocre spy pick. He has very little in terms of defensive strategies and it would be difficult for him to survive the entire game. Gan Ning seems to be well-balanced, but his presence is unnecessary since the original Gan Ning was not in dire need of an update. Based on the other character choices of the SP 2012 releases, it should not be surprising that a poor decision was made in terms of choosing a character to be 're-vamped.' As with many of the other 2012 SP characters, Gan Ning's abilities are much more complicated than they need to be.